Like many Vancouvrites, my yearly schedule always includes a visit to the PNE. It's not so much that I really need to reload my supply of Sham Wows or mops, rather, I go for the food. Of course, there are the usual places such as Whales Tails, C-Lovers, Curry-in-a-Hurry and the lot. However, over the years, there have been more and more different food options. In particular, the "anything-you-can-put-in-a-deep-fryer" variety. 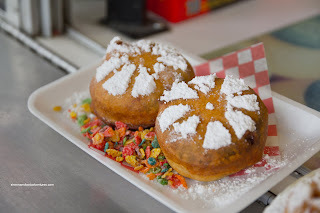 Back in 2009, I tried the fried Jelly Belly as well as the fried Oreos with the latter being better. I was all set to h ead to the PNE with food on my mind when they came a-callin', literally. I was invited to sample some of their new hot items with other media on a rainy morning. But before that, I am literally going to get ahead of myself and fast forward to the end of the media tour where we were craving something savory after sampling only sweets. 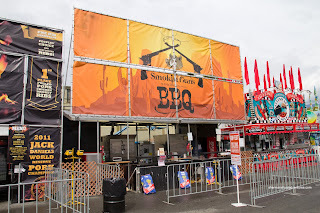 Since we were right next to the BBQ stalls, I headed over to Smokin' Babes, where they were serving up big racks... Er... Anyways, this was the continuation of my BBQ mission from last years PNE where I was only able to hi t up 3 of the 5 vendors. I went for their $22.00 platter which included 4 pork ribs, pulled pork and brisket. Sadly, this was my least favourite as the meats were really dry, especially the brisket. 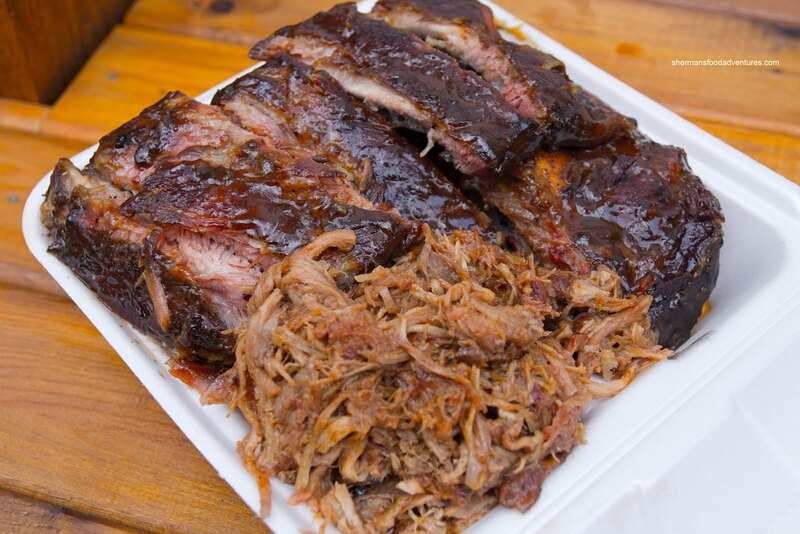 The sauce was zesty, tangy and sweet, which was quite appetizing, but that didn't help save the stringy pulled pork. 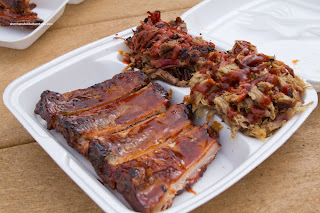 The ribs were slightly better as they were fall-off-the-bone, yet hardly tender. 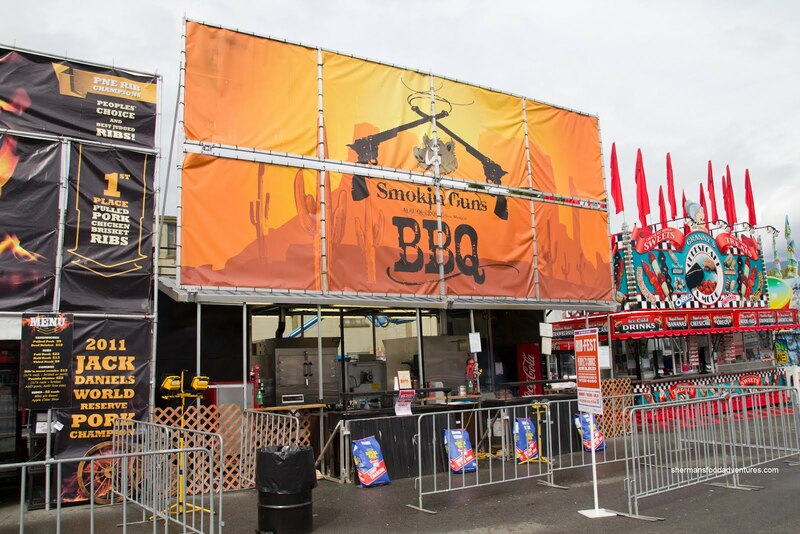 If one likes a drier BBQ, this would be it. The very next day (I'm really out of chronological order here...), I went and tried out the last stall being Smokin' Guns. Unlike everyone else, they did not have any brisket. Rather, they had a beef and pork rib combo for $23.00. I added a pound of pulled pork for $6.00. This meat monstrosity was my favourite of the bunch. The pulled pork was moist, not oversauced and tender. And the sauce was a good balance of sweet and smoky with a hint of spice. The pork ribs were moist, well charred and had a nice bark. The same could be said about the beef bones as they were not dry at all, yet had a nice exterior bark which was chewy and smoky. Only downside was the big pool of oil from the all the meats especially the pulled pork. I realize there should be fat, but this was a bit unappetizing. 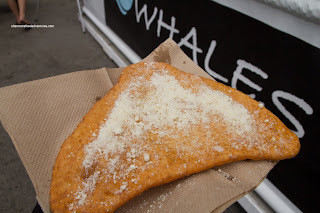 A visit to the PNE would not be complete without a simple fry bread called Whales Tail (or elephant ear, beaver tail or a interpretation of bannock). My son loves it only with Parmesan. He was wanting another once he finished. There is something about a piece of fried dough which soaks the paper towel it is on... But hold on, he can't just eat fried bread... 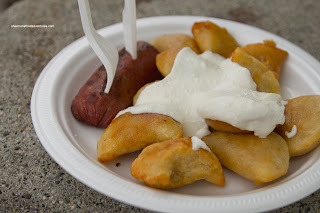 So we picked up a plate of Perogies from Hunky Bills (yah, much healthier eh?). These fried carb-heavy dumplings were oily, sweet (from the onions) and buttery. The dousing of sour cream and side of sausage qualified it as fair food. I'm glad we did a fair bit of walking as I could feel the calories pile up. Okay, back to the media event... Meeting up with some of the regulars (Sean, Kevin and Alvin), we set out towards the Showmart to sample Monkey Butter. 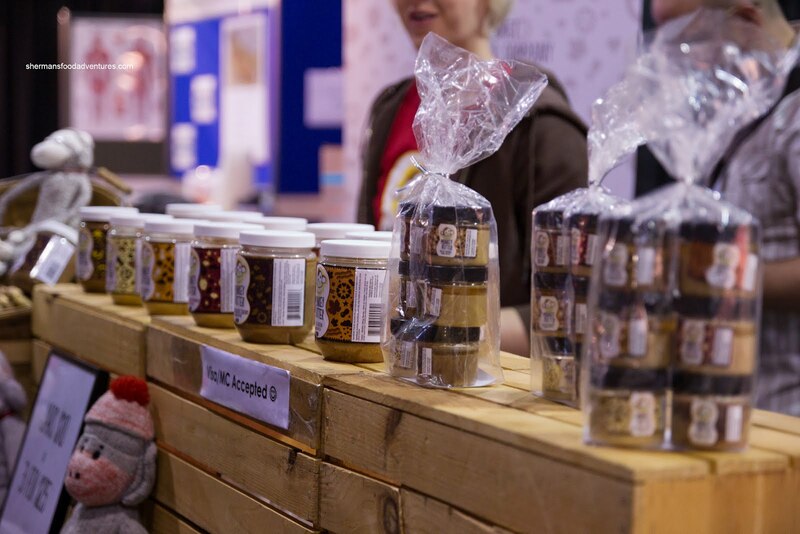 This is a small business originating out of Vancouver producing an all natural peanut butter in an array of gourmet flavours. 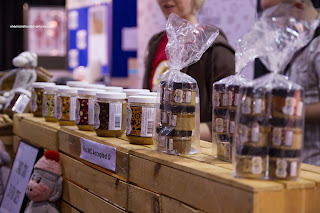 I got to sample the Bacon Peanut Butter and I could really taste the difference. It was not too sweet, a bit runny and very peanutty. As Michelle (from the Georgia Straight) stated, it could've been heavier on the bacon. Heading out from the Show Mart, we made our way to a familiar vendor - Pennsylvania Dutch (where I had the fried Jelly Belly and Oreos). This year, they put a spin on their funnel cake by adding maple and bacon (hmm... a bacon theme going on here). 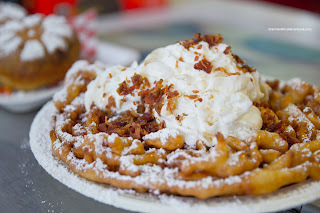 Of course, the funnel cake was as good as it has been in years past being crisp and light. The addition of maple syrup and what appeared to be Costco bacon bits, contributed a sweet and salty slant. I also got to sample their new item which was the Fried Wagon Wheels. Predictably sweet and gooey inside, it reminded me a of a fried smores. Definitely not a diet food (am I repeating myself?). 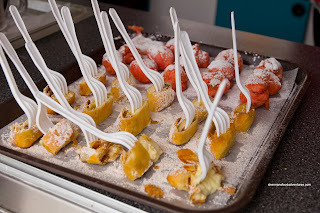 Around the corner, we were led to a brand new vendor, Powers Chocolate, which featured 2 chocolate fountains where skewers of fruit and treats were covered in sil ky dark and milk chocolate. 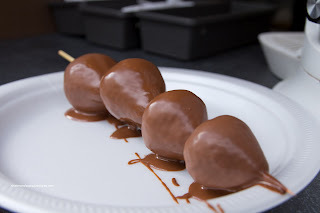 I sampled both the chocolate-covered strawberries and the peanut & chocolate covered mashmallows. I liked how the chocolate didn't rely on sugar for flavour. Rather, it was not too sweet and had a nice sheen, indicating it was higher quality. I was surprised that even the marshmallow covered in chocolate wasn't overly sweet either. From a newbie to a classic, we headed over to La Casa Gelato for some samples. Although I have certain preferences for gelato in Vancouver, there is no denying the popularity of La Casa at the PNE. We sampled 2 of their new offerings in Durian and Maple Bacon. Durian is an acquired taste which I can most accurately describe as having a fruit gaminess. It is definitely sweet and aromatic, but can be off-putting to some. As for the Maple Bacon, it was more maple than bacon (what's with the maple bacon theme?). 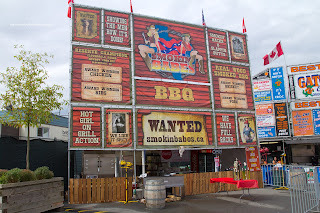 Sheesh, I wish you had posted this last week as I just couldn't decide on which BBQ place to try for ribs. I found the pulled pork at Smokin Gun the best tasting and value for the money, but made the mistake of trying the ribs from last year's winner (it was dry). Should have stuck with Smokin Guns. 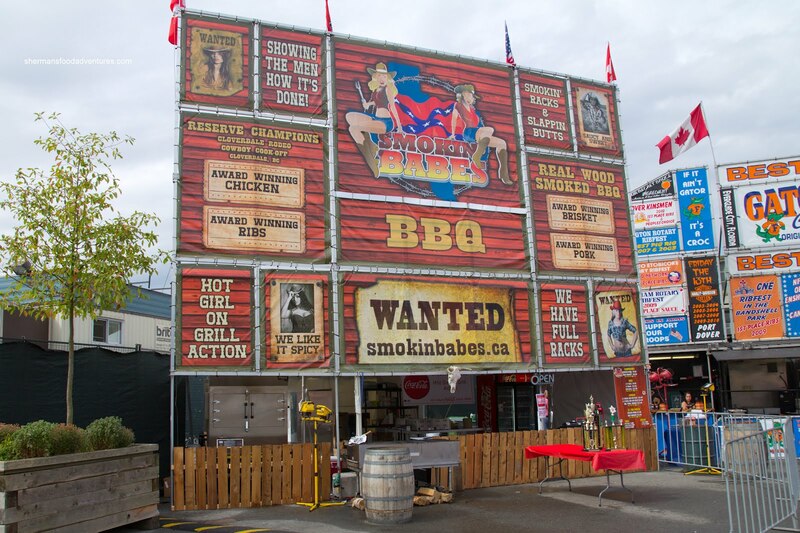 I'm glad I didn't choose the ribs from the the girls' stand, as I couldn't get over the cheesy marketing but I did like the spicy sauce they used. I really wanted to try crazy dogs but I know that it would have filled me up and I wouldn't be able to enjoy the meats. I wish I had gone to the marketplace and picked up some more monkey butter but I was too tired by then. @KimHo Yes, Maple Bacon is getting boooooring... I love the PNE!